In case you haven't noticed, hardware makers have been on a mission to outfit every conceivable PC part and peripheral with RGB lights. It started with case lighting then spread to mechanical keyboards, and now they're everywhere—mice, mousepads, RAM, and even gloves. That last item hasn't quite caught on with gaming peripheral makers, but give it a year and let's see where we're at. 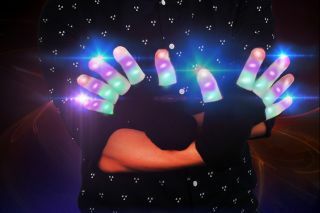 For now, RGB gloves exist for raves "or just walking around your neighborhood during the holidays," as an Amazon description for a pair of Chnano LED gloves reads. The folks at TechReport put Chnano's flashy garb to the test as a typing aid and noted that the "stretchy fabric of the gloves provides moderate protection from extreme temperatures" but when paired with a mechanical keyboard outfitted with Kailh switches, there was "no performance benefit to having lights on our fingers." Just the opposite, wearing gloves diminished the feel of typing on a mechanical plank and hurt typing accuracy. "The gloves were unsuitable for gaming because the fabric was somewhat slippery against the game controller, and gamepads without rubber inserts repeatedly slipped from our hands," TechReport noted. Not all is a lost cause, though. These gloves feature half a dozen lighting modes and come with a replaceable CR2016 3V battery. That has to be worth something, no? It's worth $9, based on Amazon's pricing. Or you could try your luck with a less expensive pair by BonBon that sells for $7. Laugh, cry, or shake your head—we both know that peripheral makers will eventually offer these things, but at exponentially higher prices. A year ago we thought RGB lighting might be a fad. Now we fear it will become an epidemic.